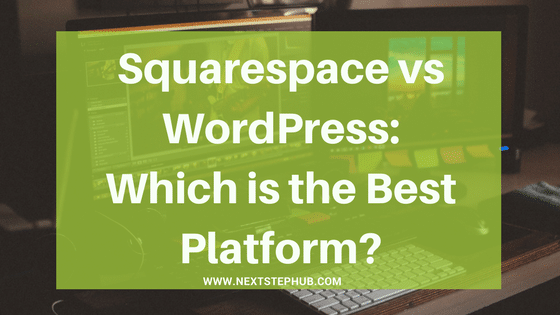 Content Marketing Platform: Wordpress vs Squarespace, Which is Best ? Picking the right content marketing platform for your website is a crucial step. Your platform should help you build awareness, leads, and revenue from your content. There are many platforms nowadays but there are two popular brands. The WordPress and Squarespace. Both platforms are reputable and can help you build a functional website. Choosing between the two can be hard because each of them has strengths and weaknesses. To help you decide, we explored the key features of two platforms. We also broke down the pros and cons of using WordPress and Squarespace. WordPress started as a blogging platform. Today, it’s one of the most popular content management systems. According to recent stats, around 15, 886, 000 websites use WordPress. WordPress has thousands of different designs to choose from. There are themes for almost every kind of business. Some are paid, while some are free. Aside from themes and templates, there are also thousands of free and paid plugins. You can use them to add features to your website. A popular example of WordPress plugins is Yoast, a comprehensive SEO software. There are WordPress plugins that can let you integrate any payment platform. You can use Paypal, Google Checkout, Stripe, Payoneer, and even Skrill. Apart from that, there are themes that suit e-commerce websites. They also have tools that can help you manage affiliate tracking and add affiliate links. When it comes to products, you can add as many products as you wish. Backups can save you and your data if your site gets hacked. WordPress has several free and paid backup plugins. These tools are helpful if you want to move your content to any other content management system. 4. Ideal for multilingual sites. If you need multiple versions of your website in different languages, WordPress has plugins for you. This allows you to connect with your audience across the globe. 1. Mastering the platform can take time. If you’re not tech savvy, WordPress can be overwhelming at first. You need to be familiar with terminologies, like the difference between posts and pages. Some business owners hire experts that can help them run their websites. If you want to master all the features, you have to invest some time to learn them all. Though there are thousands of plugins, some of them are mediocre and not performing well. Since the community is large, it is impossible to monitor the quality of every plugin. The WordPress community provides resources and tutorials. However, since it’s a big community, it can be hard to find relevant help sometimes. 4. Maintenance is your responsibility. In WordPress, you’re in charge of your site’s maintenance. You have to ensure that you’re using the updated versions of your themes, plugins, and tools. It can be handled automatically, but you still need to be careful. An outdated plugin can make your site vulnerable to being hacked. You can use the site for free and never pay anything to get the basics. But if you’re using it as a business tool, you’ll need extra perks like domain registration, premium themes, and plugins. These, of course, are mostly paid. 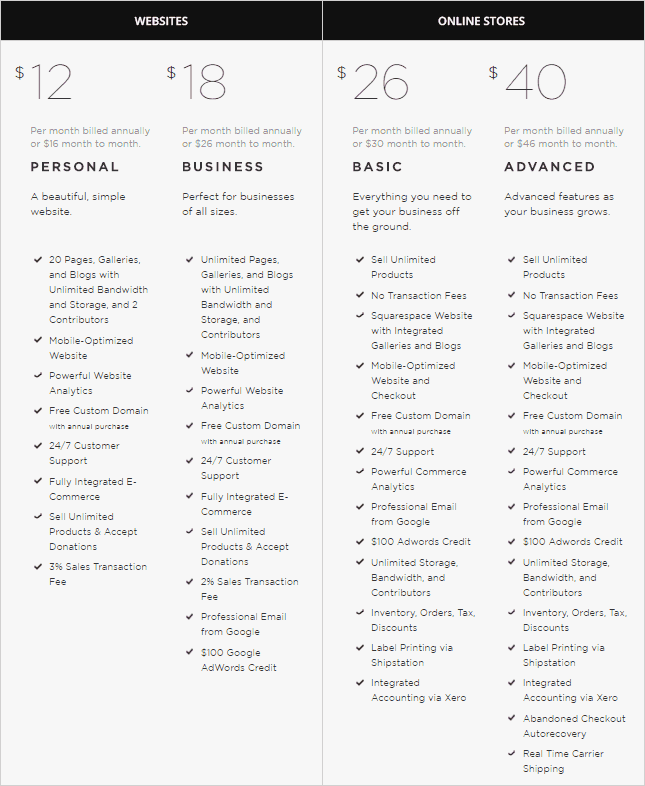 Below are the plans and prices WordPress offers. Over one million users are paying to use Squarespace. It’s a design-oriented platform. Like WordPress, it also lets you create a functional site. Squarespace is easy to use and understand. It has drag and drop interface, and its style editor is straightforward. You don’t have to hire an expert who can run your site. 2. Clean, minimalistic, and sophisticated templates. Squarespace’s templates are rich and attractive. The designs are visually stunning and mobile responsive. It makes your website look expensive. This is what sets Squarespace apart from other platforms. They have a centralized support system. They provide workshop videos, support articles, live chat, and one-hour response email support. Squarespace takes care of software updates, hosting and server configuration. You don’t have to worry about the technical aspects of maintaining your website. There’s a limited number of templates to choose from. The changes you can make in each template are also limited. In terms of plugins, you can only use the plugins and features built-in Squarespace. You can only use Stripe for payment processing on this site. This is only available in selected countries, which restricts you to accept payments from global consumers. The number of products you can sell also has limits, both on personal and professional plans. These limitations can prevent your online business to grow. 3. Only certain files can be exported. You can only export your content in an XML file. This includes your pages, galleries, and blog page with its posts. Your products pages, album pages, text, audio, and videos will not be exported. Squarespace gives free 14-day trial period without asking for your credit card. If you need more time, they can extend your trial by 7 days. Below is the list of their plans and their prices. Choosing the right platform is entirely up to you. It all depends on your budget, what your business needs, and goals you want to achieve.